Masroor Rock Cut Temples (Masrur Temples) - Sometimes in the 8th or 9th century - but most likely in the second half of the 8th century - one of the characteristic sandstone ridges in Kangri valley was reshaped in a miraculous way. Shrikhand- a pilgrimage place for Hindus. 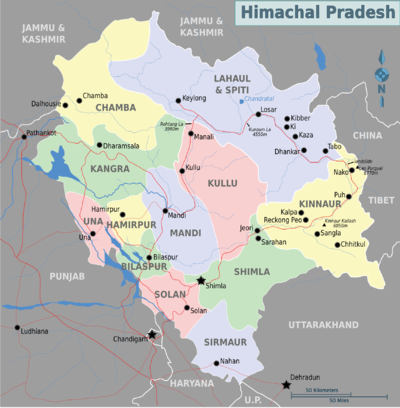 Western Pahari, Hindi, Punjabi and English are the main languages spoken in the state. Every district has its own dialect e.g. Kangri, Kahluri (Bilaspuri), Mandyali, Kullvi, Mahasui, Sirmauri etc. Shimla, Kullu (for Manali) and Kangra or Pathankot (for Dharamsala) have small airports, with services largely limited to Delhi. Flights are frequently cancelled or delayed by adverse weather. In addition the airport in Pathankot (Punjab) can be a convenient connection for Dharamsala and Dalhousie. If you are on a tight budget you might want to skip this option as it is way more costly than other mode of transportation. Airfare on this route is one of the highest in world for a given unit distance. Airport in Shimla is at Jubbal Hatti which is around 40 km away from main Shimla City. Given the difficult geographical position of State there is very little penetration of railway network. Little rail network available give access to peripheral districts and capital Shimla. Nevertheless it is an amazing experience going from Kalka to Shimla. Kalka-Shimla railway track is also UNESCO world heritage site. Few points in Himachal are easily accessible by train, but there are narrow-gauge railways from Pathankot (Punjab) to Kangra and Kalka (Haryana) to Shimla. This will take you through beautiful rural Himalayan regions. The ride beyond Kangra is amazing. You ride along the Dhauladhar range of the Himalayas via Palampur and Baijnath to Joginder Nagar. The region is criss crossed by rivers and streams. all three routes are interconnected within Himachal. 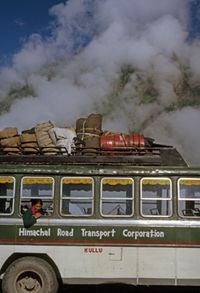 It is cheapest means to travel in and around Himachal. There are Volvo buses operated by Himachal State Transport Corporation on these routes. Kunzum La to Chandrataal Hike This is one of the shorter hikes of around 8 km from Kunzum La till Chandrataal Lake. Terrain is not that difficult, but high altitude may pose some problem for people not used to it.. In the Tibetan influenced regions, "Chhang" (fermented rice wine) is common. Different regions have different cuisines and food processing techniques which are governed by factor like agro-climatic conditions, and socio-clutural ethos.. This page was last edited on 16 March 2019, at 11:02.